Wahoo's Fish Taco’s corporate office in Orange County, California, is decorated with a wall of colorful surfboards, posters of athletes in the ocean and snow, and merchandise sporting the brand's iconic fish-on-a-surfboard logo. “Out of 365 days, I remember only taking Christmas and Easter off. It was instilled in us. We took a business approach to how we run our restaurants." Lam and his four brothers grew up in the city of São Paulo, Brazil, in the 1960s and 70s, after his parents fled the Communists in China shortly after World War II. The brothers grew up speaking conversational Portuguese, Chinese, French, and Spanish. Their father, a chef, regularly cooked at home and taught the brothers their way around the kitchen. The only Chinese family among a wave of Japanese immigrants in town, the Lams owned a successful restaurant business away from central São Paulo for several years, until Lam's father, Lee Cheon Kwong, came to Orange County, California, to open up Shanghai Pine Garden restaurant. “My parents are what you call 'survivors.' They see when an opportunity is really good, and they take it,” Lam said. When Lam was 14, the family moved in January 1975 to the coastal town of Costa Mesa. The adjustment was difficult, Lam said. He was one of a few Asian children at his school that didn’t speak English, making assimilating initially difficult. “People look at you and just assume you speak English,” Lam said, noting the differences between “textbook” English and “street slang,” most of which he picked up watching ‘70s TV sitcoms. Lam — who now speaks regularly at events for businesses, churches, and charities — eventually found a way to fit in through his love of outdoor sports. He swam in high school, played water polo, and soon discovered a love of surfing. After pursuing a degree in finance at San Diego State University, Lam first tried his hand in corporate America, working for an accounting firm and an aerospace think tank. It was those experiences behind the desk that taught him about breaking the glass ceiling. “When you can't move forward, you choose to either be pigeonholed until somebody decides to lift the ceiling, or you go choose to do something else,” he said. At 26, Lam left his corporate job and went to work with his younger brothers Eduardo and Mingo on what would become global franchise Wahoo's Fish Taco. 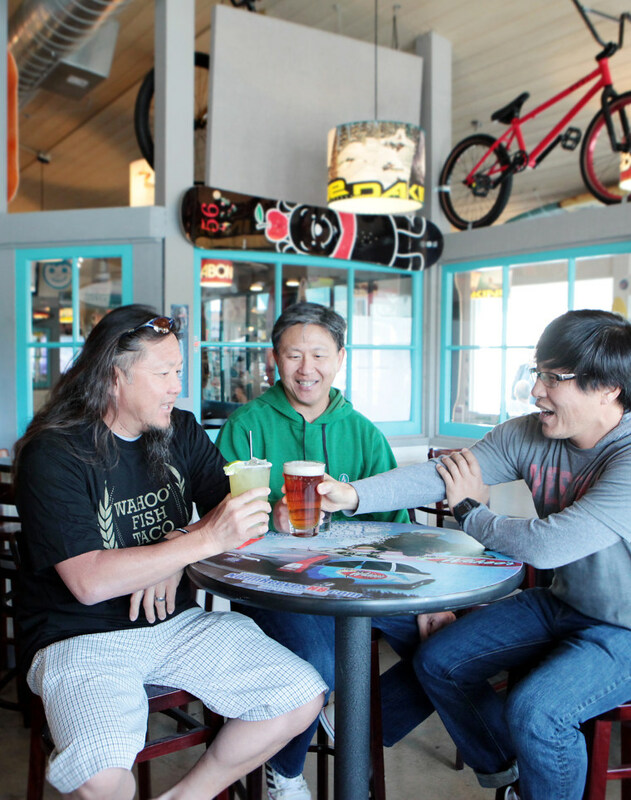 While growing up in São Paulo and beside the beach gave the Lam brothers athletic chops (and love of surf culture and food), helping to run a successful family business in Orange County gave them the ingrained experience managing a restaurant. They founded the restaurant in 1988, a time when the food landscape was changing. “People wanted to eat quicker, so we decided on fast-casual, and we were one of the first to do that in our category,” Lam said. The first few years of the business, Lam said, was investment, partnerships with athletic brands, and building the restaurant chain from the ground up — all while raising his first child, Greg, from a previous marriage. Born from a love of surf and regular trips to southern Mexico (for more surfing and authentic, street fish tacos), Wahoo's Fish Taco quickly became a reality. The first restaurant opened up along the beach in Costa Mesa, minutes from Lam's home. It soon became a hub for Orange County surfers and beach-goers, he recalled. The brothers wanted to create a fresh, healthy menu to appeal to its growing clientele. Wahoo's menu describes itself as a “fresh, light and tasty fusion of Brazilian, Asian, and Mexican fare — da kine grinds,” referring to a Hawaiian-Pidgin expression meaning good food. By grilling the fish rather than deep-frying it, Lam said, his food has an all-natural, healthier taste that imitates a Hawaiian mixed lunch plate. Lam added that his restaurant is a reflection of fused cultures — a sentiment which, growing up Asian both in Brazil and California, he can relate with. “It brings a little bit of our Asian ancestry, a little bit of Brazil, and one of the first places we got to go surfing [Mexico]. So it's not just trendy food, but a story...this is the stuff we grew up eating,” he said. The business became more established through ongoing partnerships with athletic brands (such as Quicksilver, Billabong, and Hurley), becoming the official go-to restaurant of some of the biggest sports names, companies and competitions — including surf champion Kelly Slater, Olympic snowboarder Shaun White, and the X Games — in the world. Twenty-eight years later, the Wahoo's menu has adapted and expanded, along with the business. There are now 60 stores across California, Colorado, Nevada, Nebraska, Texas, Pennsylvania, Hawaii, and Japan, according to the website. At home in Newport Beach, Lam prefers putting together minimal, protein-full dishes, such as salad bowls with homemade dressing and pasta. He works out regularly, golfs, and snowboards, and still enjoys the beach surf. He and wife Kelly love to travel locally, try new restaurants, and recently had their first child, 14-month-old Levi. Lam, now 55, is proud of his local reputation as the long-haired Asian guy who surfs, makes fish tacos, speaks at organizations and charity events, and has a solid faith in God — but he doesn't go by all the labels.